But let's look at the surrealistic clues from the 1950s! Notice the once czarist double headed eagle on each side of the top of the throne, with the cross in the middle. The hammer has morphed into some sort of winged missile (maybe a guided missle like the G-3 or the Buran), and it has broken through and left behind the wheat sheaf which had been the handle of the sickle (a prediction that the arms race would be in clear conflict with necessities like food). Most significantly, note that the blade part of sickle has reversed directions so that it now forms an Islamic crescent, and has been joined by the star to form an unmistakable Islamic star and crescent. As to why the two RINOs rhinos would be propping up the Russian throne, who can say? 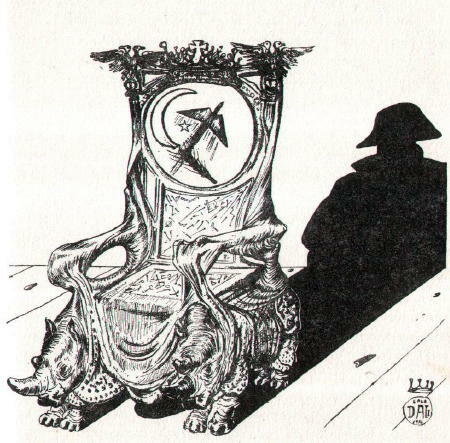 Ask Napoleon about the shadow.